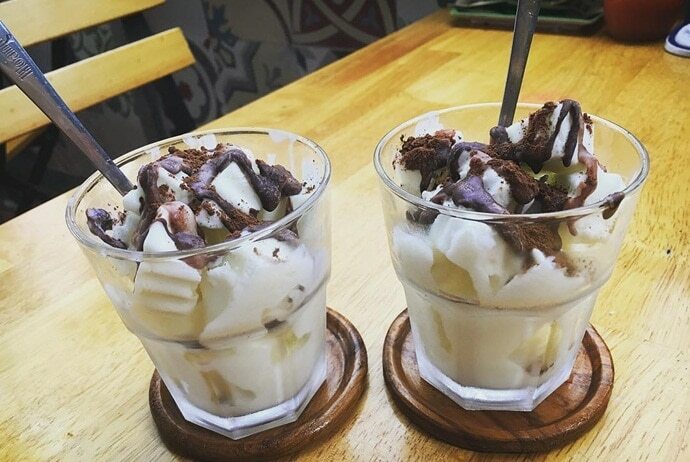 Home » Vietnam Travel » Vietnamese Food » Vietnamese Clammy Yogurt – Sua Chua Deo – Try A Special Dessert! 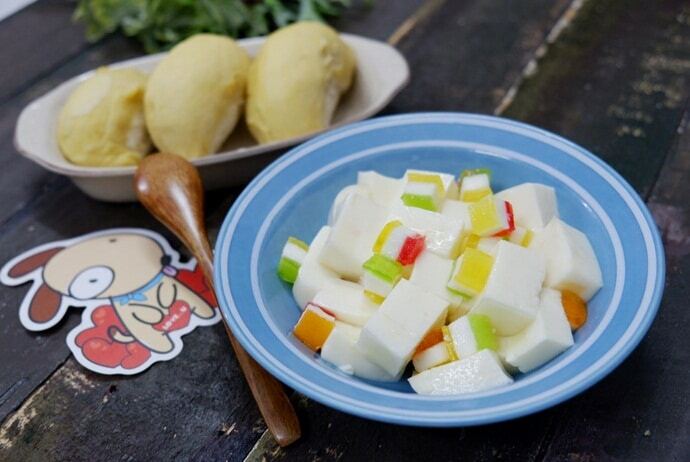 Clammy yogurt or “sữa chua dẻo” is a favorite snack for both children and adults in Vietnam. This is really a super yummy light snack for hot summer days due to its cool, soft, chewy texture, and light sweetness. You can enjoy clammy yogurt at coffee shops or yogurt stalls in Hanoi or try making this side dish at home. The formula is simple, easy to do, and does not require expensive ingredients or tools. In this article, we will expose how to make this kind of yogurt at home as well as some of the best places where you can enjoy clammy yogurt when coming to Hanoi. Apart from fried dishes and hot snack foods, the summer is the great time for enjoying sweet treats, such as tea, jelly, yogurt, etc. And, one of the indispensable summer snacks in Vietnam is clammy yogurt. Looking through the ingredients, there is no big difference between clammy yogurt and regular yogurt, but clammy yogurt can be cut into large cubes, eaten with cocoa powder, green tea powder or fresh fruits. This is a wonderful combination of yogurt, flavor powder and tropical fruits which has attractive taste and eye-catching design, making everyone want to crave. Clammy yogurt is one of the most popular snacks for women today, especially in summer. It is very good for the digestive system and is one of the effective skincare products. And if you do not have time to make this snack at home, you can visit any of the following stalls to enjoy this clammy yogurt in Hanoi. There is a street that has become familiar to many young people when you want to enjoy delicious clammy yogurt on hot days. This is a well-known name in the gourmet community as one of the best places to sell clammy yogurt in Hanoi. Clammy yogurt is cut into square cubes, with the ice at the bottom and topped with a little cocoa powder. When enjoying, you do not hurry to mix it. Instead, you should use a small spatula to feel the clammy yogurt and sweet bitter cocoa powder melt on the tongue. Apart from cocoa flavor, you can try blueberry, matcha green tea, kiwi, etc. The owner of the shop also modifies the yogurt. The combination between clammy yogurt and many different fresh fruits is so unique. When it comes to enjoying clammy yogurt in Hanoi, you should not skip this shop on Hang Non Street. The yogurt here is simple but very delicious. You will surely love the taste of this clammy yogurt. This special yogurt is sold on the sidewalk along Hang Non with relatively affordable prices. The process is also very simple. The ice cubes are at the bottom of the cup, followed by some pieces of chopped clammy yogurt and finally a little bit of the toppings such as cocoa powder, green tea powder, etc. The cup of clammy yogurt looks very delicious and beautiful. 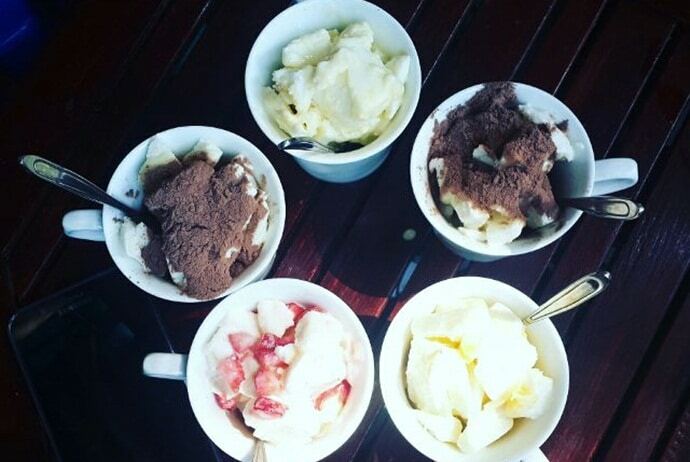 At Hang cafe at 37C Duong Thanh Street, you can enjoy cool drinks such as chocolate cream, coconut cream, clammy yogurt, etc. with affordable prices for young people. This stall has developed over 20 years in Hanoi with the aim at satisfying all of the consumers. This stall opens from 7:30 am with the cool drinks and delicious dishes, being one of the most attractive destinations for young people in summer. With clammy yogurt served with cocoa here, you cannot mix or crush as other yogurt. Instead, you have to cut it into pieces in order to feel the mixture of cocoa and yogurt slowly melted on the tongue. In order to do that, the owner gives a small layer of crushed ice at the bottom just to ensure the temperature for yogurt. Apart from Vietnamese clammy yogurt, you can enjoy coconut ice cream. The shop is located right at the intersection of Hang Non and Duong Thanh. The shop owner always smiles and be enthusiastic with customers. Therefore, if you want to enjoy this special kind of yogurt in Hanoi, you can consider coming to this shop on Duong Thanh Street. When speaking of yogurt, many people think of the “cream yogurt”. It is a homemade yogurt that is not soft as other regular kinds of yogurt and it is also not too hard. Clammy yogurt is slightly flexible and spongy like ice cream. 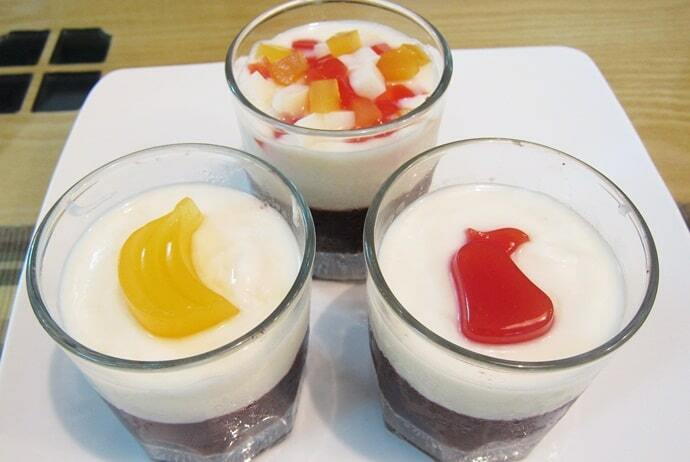 In addition, the yogurt here is accompanied by the taste of fruits such as orange, mango, peach, strawberry, durian, etc. 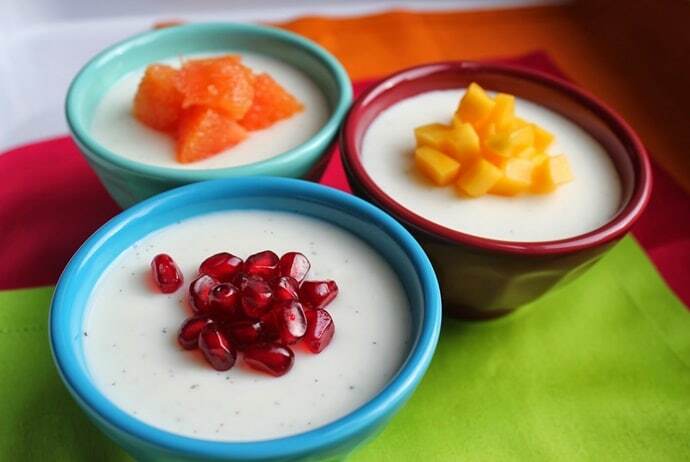 Depending on your personal taste, you can choose for yourself yogurt with your favorite flavor. Plus, there are some unique combinations such as clammy yogurt with coffee, cocoa, yellow sticky rice, sticky rice, etc. The Vietnamese clammy yogurt here is not too unique, but in hot summer days, the taste of clammy yogurt melted in the mouth will make people happy. It is better than regular yogurt mixed with ice. This is one of the best shops where sell clammy yogurt in Hanoi thanks to its flavor and affordable price. It is located on Cat Linh Street and is always crowded with consumers during the weekends. 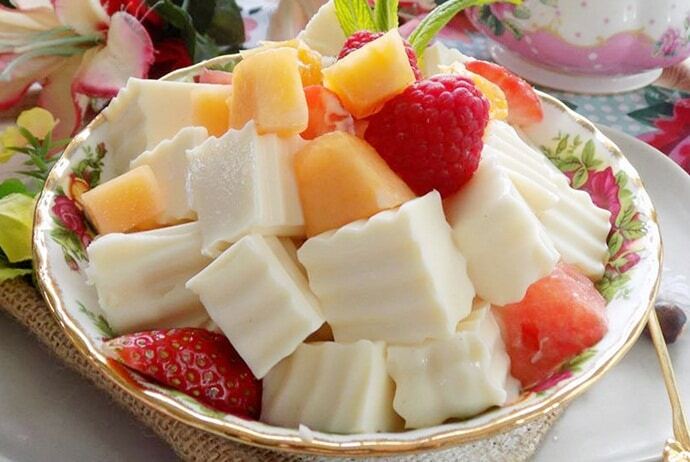 The clammy yogurt is frozen first, then cut into square pieces. Then, consumers can choose the flavor and add fresh fruits. Finally, the dish is finished with syrup, which looks gorgeous and attractive. The Vietnamese clammy yogurt here has a sour and sweet taste. The topping is decorated with fresh fruits like kiwi, green tea, blueberries, and chocolate syrup. 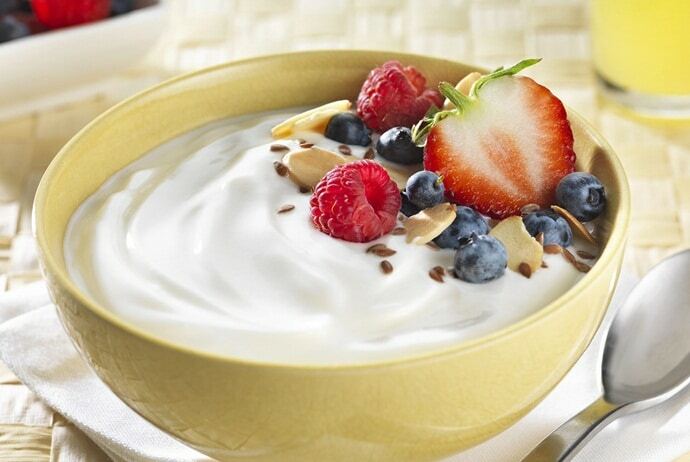 When eating, the sour and sweet taste of clammy yogurt combined with fresh fruits makes people feel better. However, the yogurt here has not reached the certain degree of plasticity, so when it is easy to dissolve. In Hanoi, there are some places where you can enjoy the sour and sweet taste of Vietnamese clammy yogurt. This kind of yogurt is so unique and you have to use a spatula to cut into square pieces before enjoying. Actually, this dish is so great, especially on hot days. 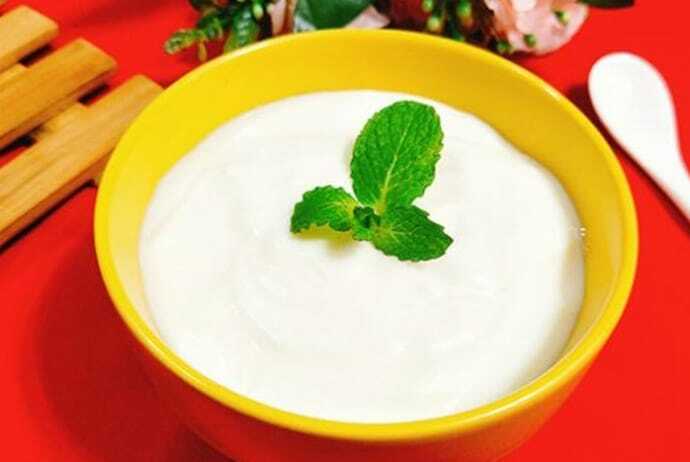 As a result, if you have a chance to visit Hanoi or if you love the coolness and sweetness of yogurt, you should try out this kind of yogurt and you will never regret about your choice. Do not hesitate to come back to VinaFood if you want to learn information about more tasty dishes to try in Hanoi.